Earth Day the New Christmas? As More Marketers Pile On, Consumerism May Eclipse Spirit of Event By Natalie Zmuda posted on Ad Age Published: April 14, 2008 NEW YORK (AdAge.com) — It’s nearly Earth Day: Time to consume more to save the planet. Newsweek subscribers can actually fashion the cover of the April 14 issue into an envelope to send plastic bags to Target in return for a reusable tote bag. As April 22 approaches, marketers of all stripes are bombarding consumers with green promotions and products designed to get them to buy more products — some eco-friendly, some not so much. And while that message seems to contrast with the event’s intent, the oxymoron seems to have been lost on marketers jumping on the Earth Day bandwagon in record numbers. This year it seems that just about everyone has found a way to attach themselves to what is fast becoming a marketing holiday that barely resembles the grass-roots event founded in 1970. Read more. 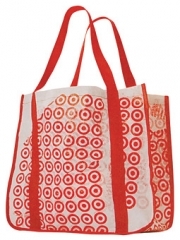 Newsweek subscribers can actually fashion the cover of the April 14 issue into an envelope to send plastic bags to Target in return for a reusable tote bag. Read related post. This entry was posted on April 14, 2008 at 12:02 pm and is filed under Uncategorized. You can follow any responses to this entry through the RSS 2.0 feed. You can leave a response, or trackback from your own site.